Central Washington University student photographer Zahn Schultz won first and third place in the 2018 College Media Shoot-out in Louisville, Kentucky. His first-place photo was ranked first by 12 of the 39 professional photographers, more than any single image in the last decade. 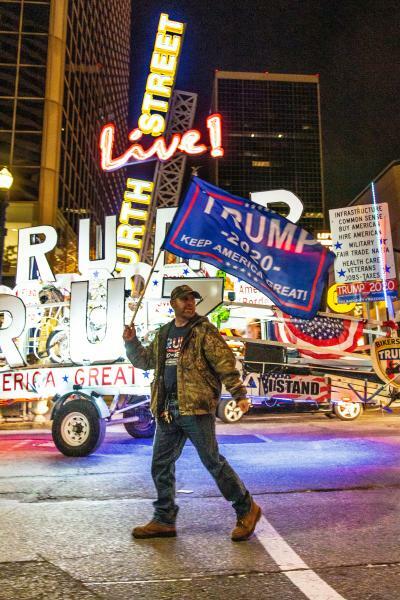 Schultz captured the winning photograph while walking in Louisville on a Thursday night. He witnessed a massive Trump float traveling down a sparsely populated street. On the float were people waving and holding signs while a man stood in the forefront waving a flag. Schultz, a film major and PULSE Magazine’s director of photography, attended the Associated College Press (ACP) national convention along with other PULSE staff. About 30 photographers competed in the competition, where each could submit two photos for judging. His second entry, “Barbershop,” earned Schultz third place. Schultz expressed his appreciation for the barbershop in contrast to the Trump float image. “It showed that Louisville had a tight-knit sense of community and that the people know each other and you’re bringing people together—which is kind of a juxtaposition sometimes to some of the rhetoric that goes along with you know the political aspect of the other photo,” he said. His new barbershop friends asked Schultz to send them copies of the next issue of PULSE where their photo is featured. Schultz said he was happy to oblige. PULSE Fall 2018, Issue Two is now available featuring an article and photographs by Schultz. For more information about PULSE, contact faculty adviser Jennifer Green at Jennifer.Green@cwu.edu, 509-963-3216.